Beacon Hill is a hill in Flint County, San Andreas. South of the hill is Flint Range, while to the north is Fallen Tree and Flint Water. 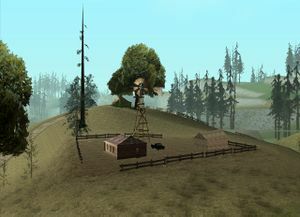 To the west/southwest is The Farm and Leafy Hollow, while to the east is Red County and the northern portion of Los Santos. Near Beacon Hill is an unnamed gas station and an RS Haul depot, where the player can access Trucking missions. Beacon Hill consists of nothing more than three wooden structures and a windmill, with a low wooden fence surrounding the area. Beat-up Sadler. However, sometimes a regular Sadler appears. This page was last modified on 15 March 2015, at 06:53.